NASA's Parker Solar Probe mission will revolutionize our understanding of the sun. NASA's Parker Solar Probe mission will revolutionize our understanding of the sun. Parker Solar Probe will provide new data on solar activity and make critical contributions to our ability to forecast major space-weather events that impact life on Earth. 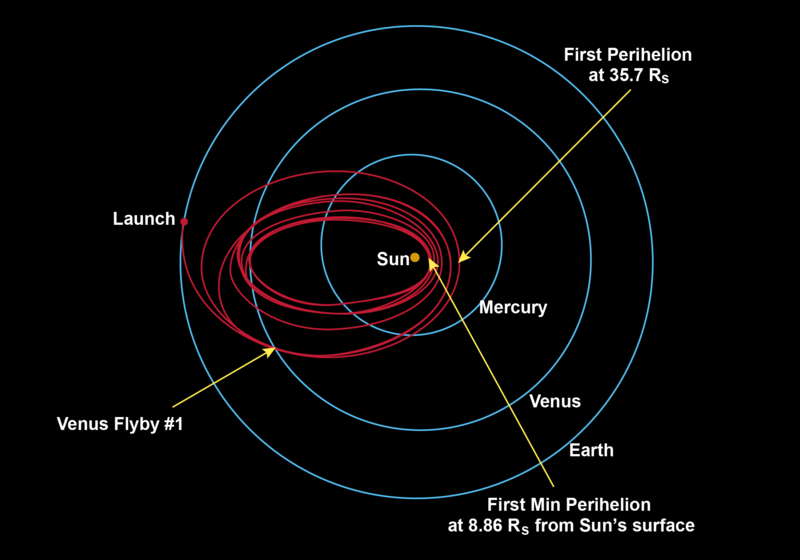 On the final three orbits, Parker Solar Probe will fly to within 9 solar radii of the sun's "surface" 9 solar radii is 9 times the radius of the sun, or about 3.83 million miles. That is about seven times closer than the current record-holder for a close solar pass, the Helios spacecraft. At closest approach, Parker Solar Probe will be hurtling around the sun at approximately 430,000 miles per hour! That's fast enough to get from Philadelphia to Washington, D.C., in one second. At closest approach to the sun, while the front of Parker Solar Probe' solar shield faces temperatures approaching 1,400° Celsius, the spacecraft's payload will be near room temperature. Trace the flow of energy that heats and accelerates the solar corona and solar wind. Determine the structure and dynamics of the plasma and magnetic fields at the sources of the solar wind. Explore mechanisms that accelerate and transport energetic particles. Launching in 2018, Parker Solar Probe will provide new data on solar activity and make critical contributions to our ability to forecast major space-weather events that impact life on Earth. Parker Solar Probe will swoop to within 4 million miles of the sun's surface, facing heat and radiation like no spacecraft before it. To get there, it takes an innovative route. Parker Solar Probe will use seven Venus flybys over nearly seven years to gradually shrink its orbit around the sun, coming as close as 3.83 million miles (and 6.16 million kilometers) to the sun, well within the orbit of Mercury and about seven times closer than any spacecraft has come before. Parker Solar Probe is a true mission of exploration; for example, the spacecraft will go close enough to the sun to watch the solar wind speed up from subsonic to supersonic, and it will fly through the birthplace of the highest-energy solar particles. Still, as with any great mission of discovery, Parker Solar Probe is likely to generate more questions than it answers. The MissionWhere is Parker Solar Probe? The plot below shows Parker Solar Probe's location and speed (relative to the Sun) as it conducts its science operations. 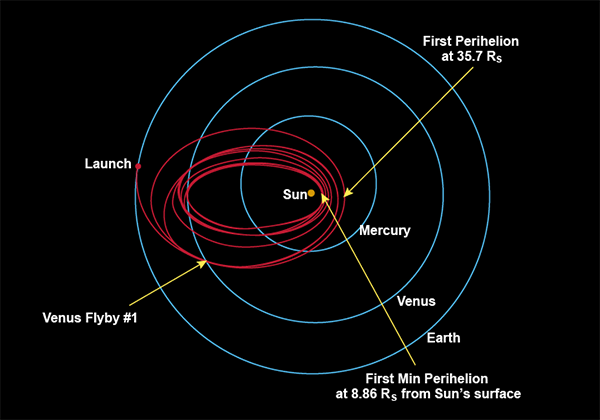 The spacecraft is in a highly elliptical orbit around the Sun (the yellow dot at the center of the plot), reaching its aphelion during the course of the mission initially at Earth and eventually closing to the orbit of Venus. Parker Solar Probe will perform seven Venus flybys in order to more precisely set its trajectory toward the Sun; these flybys will slow the spacecraft down, instead of speeding it up, which is a more common use for planetary flybys. Speed in relation to the Sun; given in kilometers per second. One kilometer per second equals 0.62 miles per second, or 2,237 miles per hour. This stands for Astronomical Unit, which is the distance from the Sun to the Earth, and one AU equals about 93 million miles or just under 150 million kilometers. This stands for Solar Radius, or the distance from the center of the Sun to its surface, which is about 432,000 miles or 696,000 kilometers. 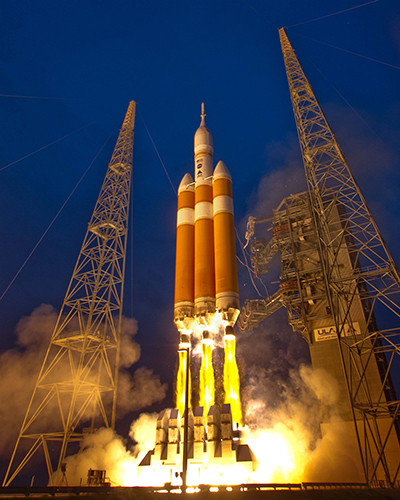 It has been nearly 60 years since the "Solar Probe" Concept was introduced. . . We are on our way! Parker Solar Probe will be a historic mission, flying into the sun's atmosphere (or corona) for the first time. Coming closer to the sun than any previous spacecraft, Parker Solar Probe will employ a combination of in situ measurements and imaging to achieve the mission's primary scientific goal: to understand how the sun's corona is heated and how the solar wind is accelerated. Parker Solar Probe will revolutionize our knowledge of the origin and evolution of the solar wind. Integration and test formally started on 1 July 2016 with delivery of the flight structure with the integrated Propulsion Subsystem.